The top left photo shows a pair of stud earrings in a martini setting. The photo on the top right shows the halo jackets. And the bottom photo shows the final product. One of my favorite aspects of working in the jewelry industry is being creative with the jewelry that you already own. 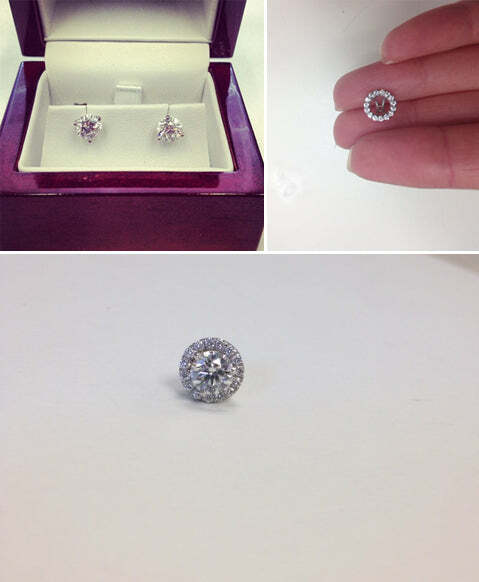 One area where I think there is a tremendous amount of options is with diamond stud earrings. Diamond earrings can be expensive and so it is difficult to get large diamonds in a reasonable budget. I find that it doesn’t take long before one becomes bored with their diamond earrings and desire larger stones. I landed in this predicament only 2 years after what I thought was the largest investment of my life. I had outgrown my diamond stud earrings and decided that I needed to do something about it! I knew I would never sell my diamond stud earrings so I got creative and started to think about a halo earring jacket so that my diamonds would feel larger. This, in another word, is the day I got halo’d. With the use of CAD (computer aided design), we were able to design a pave earring jacket that would fit my diamond studs perfectly. All I had to do is push the post of the earring through the hole of jacket and the diamond slides right into place. Since I am a perfectionist, we took an extra step to create ridges in the halo so that my center diamond could dip down even lower and have a more flush design. Now that my diamond studs have been “halo’d,” they feel like they have doubled in size and in sparkle. Having more diamonds means more sparkle with every move I make. I received more compliments than ever before on my earrings, reaffirming that halos do add a lot of sparkle to a diamond. The freedom to wear my diamond studs with and without jackets opens the doors to a variety of different options. I have even convinced my mom to do it to her earrings as well!